Molokaʻi ( /ˌmoʊləˈkaɪ, -ˈkɑːi, ˈmɒlə-/;  Hawaiian: [ˈmoloˈkɐʔi]), nicknamed “The Friendly Isle”, is the fifth largest island of eight major islands that make up the Hawaiian Island Chain in the middle of the Pacific Ocean. It is 38 by 10 miles (61 by 16 km) in size at its extreme length and width with a usable land area of 260 square miles (673.40 km2), making it the fifth-largest of the main Hawaiian Islands and the 27th largest island in the United States. It lies east of Oʻahu across the 25-mile (40 km) wide Kaiwi Channel and north of Lānaʻi, separated from it by the Kalohi Channel. The United States Census Bureau divides the island into three census tracts: Census Tract 317 and Census Tract 318 of Maui County, Hawaiʻi, and Census Tract 319 of Kalawao County, Hawaiʻi. The total 2010 census population of these was 7,345,  living on a land area of 260.02 square miles (673.45 km2). 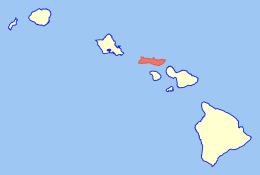 Molokaʻi is separated from Oʻahu on the west by the Kaiwi Channel, from Maui on the southeast by the Pailolo Channel, and from Lānaʻi on the south by the Kalohi Channel. Molokaʻi is split into two main geographical areas. The low western half is very dry and the soil is heavily denuded due to poor land management practices, which allowed over-grazing by goats. It lacks significant ground cover and virtually the entire section is covered in non-native kiawe ( Prosopis pallida) trees. One of the few natural areas remaining almost intact are the coastal dunes of Moʻomomi, which are part of a Nature Conservancy preserve. The eastern half of the island is a high plateau rising up to an elevation of 4,900 ft (1,500 m) on Kamakou peak and includes the 2,774 acres (11.23 km2; 4.334 sq mi) Molokaʻi Forest Reserve. The eastern half is covered with lush wet forests that get more than 300 in (7,600 mm) of rain per year. The high-elevation forests are populated by native ʻōhiʻa lehua ( Metrosideros polymorpha) trees and an extremely diverse endemic flora and fauna in the understory. Much of the summit area is protected by the Nature Conservancy's Kamakou and Pelekunu valley preserves. Below 4,000 feet (1,200 m), the vegetation is dominated by exotic flora, including strawberry guava (Psidium littorale), eucalyptus ( Eucalyptus spp. ), and cypress ( Cupressus spp.). Introduced axis deer (Axis axis) and feral pigs (Sus scrofa) roam native forests, destroying native plants, expanding exotic plants through disturbance and distribution of their seeds, and threatening endemic insects. Near the summit of Kamakou is the unique Pepepae bog, where dwarf ʻōhiʻa and other plants cover the soggy ground. It used to be thought that Molokaʻi was first settled around AD 650 by indigenous peoples most likely from the Marquesas Islands. However, a 2010 study using revised, high-precision radiocarbon dating based on more reliable samples has established that the period of eastern Polynesian colonization of the Marquesas Islands took place much later, in a shorter time frame of two waves: the "earliest in the Society Islands c. 1025–1120, four centuries later than previously assumed; then after 70–265 years, dispersal continued in one major pulse to all remaining islands c. 1190–1290." Later migrants likely came from Tahiti and other south Pacific islands. Although Captain James Cook recorded sighting Molokaʻi in 1778, the first European sailor to visit the island was Captain George Dixon of the British Royal Navy in 1786. The first significant European influence came in 1832 when a Protestant mission was established at Kaluaʻaha on the East End of the island by Reverend Harvey Hitchcock. The first farmer on Molokaʻi to grow, produce and mill sugar and coffee commercially was Rudolph Wilhelm Meyer, an immigrant from Germany who arrived in 1850. He built the first and only sugar mill on the island in 1878, which is now a museum. 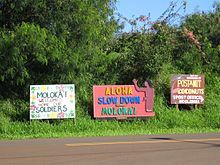 The tourism industry on Molokaʻi is relatively small, compared to the other islands in Hawaiʻi. Only 64,767 tourists visited Molokaʻi in 2015. For years, residents of Molokaʻi have resisted private developers' attempts to dramatically increase tourism. Accommodations are limited; as of 2014, only one hotel was open on the island. Most tourists find lodgings at rental condos and houses. ^ Janet M. Wilmshurst; Terry L. Hunt; Carl P. Lipo; Atholl J. Anderson. "High-precision radiocarbon dating shows recent and rapid initial human colonization of East Polynesia". PNAS. 108 (5): 1815–20. doi: 10.1073/pnas.1015876108. PMC 3033267. PMID 21187404. Retrieved 26 October 2015. ^ " Kalaupapa National Historical Park - Hansen's Disease Patients at Kalawao and Kalaupapa ( U.S. National Park Service)." U.S. National Park Service - Experience Your America. Web. 19 Nov. 2009.